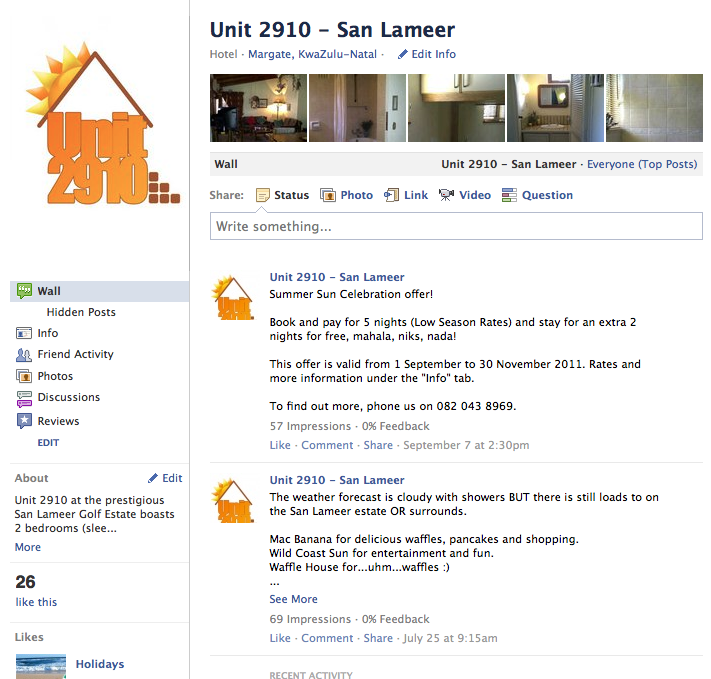 With Facebook’s Timeline, business pages have a unique opportunity to grab and engage their audiences. I thought I’d put together some thoughts, tips and guidelines on creating Facebook covers. **Be aware that if you intend to create your own images you’ll need access to a basic photo editing programme. Facebook Cover Sizes and Elements. If you upload an image that is smaller than the recommended size, Facebook will stretch it to fit automatically. Be cautious, because stretching the image will also deteriorate the image quality and you don’t want your audience to associate second-rate quality with your business brand. The Facebook frame cuts of the top pixel of your image, so in reality only the bottom 314 pixels will display. Niggly but important since you might want to check that you don’t lose the most important 1 pixel! So what can we do with our cover photo? Use imagery or design work that is yours to begin with. Grab your camera or iPhone and take pictures or ask a professional photographer to help capture your people, your brand and your products. You can have lots of creative fun with this! Remember to give credit if you use photos or visuals that aren’t yours! Use your business tagline and add it as text to your cover photo. Tag people who are in the photo. Be sure to ask their permission if they are associates or clients. If they are staff members, notify them! It is a frowned-upon tactic to tag random people in your cover to shamelessly promote your business. Get your employs and clients to submit their pictures to use for the cover. Make sure that you use high-quality photos and visuals that are in-focus. A couple of clicks an you’ll be done. To replace an existing cover photo, mouse over your cover photo so that the “Change Cover” button appears in the lower right corner; click it. Next time we’ll look into how to create GREAT Facebook Cover images! If you are serious about taking your brand online this year, you better make sure that you know what you and others are talking about. A blog (originally called weblog / web-log) is an online collection of articles (posts) targeted at a specific audience profile. For instance a travel blog will concern itself with posts and updates related to the realm of traveling, holiday spots etc. It is important to note that every blog reflects the personality of its host / author (also called a blogger). Readers respond to both the content of the blog (what is being said) and the personality of the blog (how it is presented to the reader – humourous, serious, visually etc). Tip: If you are considering a blog, decide what type of personality you will be reflecting before hand. Be consistent and make sure that your blog promotes your business with integrity and honour. In an online world this means that more than one person is contributing to a post or topic. This is a great idea as it allows subject-matter-experts in your community to weigh-in on important issues. This should increase your blog visits. A computer program that allows you to create, publish and edit content. Once your content is created, the CMS then presents it to the web where others can view and comment on. Most CMS’s provide an interface that is user-friendly and easy to operate – even for persons with hardly any web background. The social bookmarking site where users can collectively tag favorite links. As you browse the web and come across content that you find valuable / meaningful, DELICIOUS is the site that allows you to store, share and continue discovering more. Using hypertext, a link is connection between one picture, word or post to another. Perhaps it will help you to think of this as strings running between concepts that allow to jump from one to the other. Tip: Bloggers use links to create multiple entry points to their blogs and posts. This is done by creating links to your blog in as many places as possible – i.e. placing a link to your blog on your website is a good starting point. You can build your link strategy by adding links to your blog to other partner sites (remember to request permission first!). Social media refers to the means of interactions among people in which they create, share, exchange and comment contents among themselves in virtual communities and networks. (http://en.wikipedia.org/wiki/Social_media). Some of the most popular social media sites include Facebook, Pinterest, Twitter, LinkedIn, YouTube – in no order of preference. Using blogging software to write posts and schedule them for publishing in the future. A blog engine like this one (WordPress) allows you to plan and schedule your posts like you would schedule an appointment in your diary. Tags are terms / phrases or specific words that describe the nature / content of a post. Visual representations of tags or keywords used in a blog. 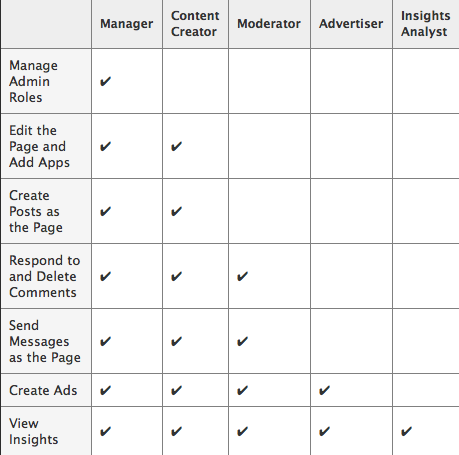 In other words a group of the most popular tags (words / phrases / terms) the blogger uses to categorize his / her posts. A collections or series of posts pertaining to a particular topic. WordPress is a Content Management System (CMS) that allows users (like you and me) to sign up for an account, to customise what our blog will look like and to publish our thoughts and comments via this “program” (I use this term very loosely) or platform. The beauty of this CMS is that you don’t need any web development knowledge to get going, it is almost as simple as typing an article in Microsoft Word. Are there specific words / phrases that has you bamboozled? Feel free to leave a comment and let’s see if I can help you clarify them. 9 Tips for Hiring a Local SEO Firm. Written by an SEO expert from Boston but just as applicable to potential SEO customers in South Africa! Despite the imminent arrival of Facebook’s Timeline, there has been no clear communicate to indicate how Facebook Business Pages will be influenced by the changes. In the meantime, let’s ignore Timeline and work with what we’ve got. Facebook business pages give businesses (individuals, SMME’s and even multi-faceted corporates) a platform from where they communicate directly with a captive, active audience. These platforms are typically not positioned as selling tools, but rather as brand-voice tools. Think of it as an opportunity for you business / brand to have an energetic conversation with an individual that actually wants to hear more about you, interesting tales that create a picture of the who, what, where and why & let’s not forget – they want competitions, polls and current, reliable information. So let’s give it to them! But how should we package this? You basically have 2 options. Creating a Business Page and populate the page with all your information. No funny business. There is no custom development and nothing out of the ordinary. In terms of functionality, it is similar to many other pages on Facebook. But it could offer so much more! Use custom development AND unique creative concepts that portray your brand favourably. 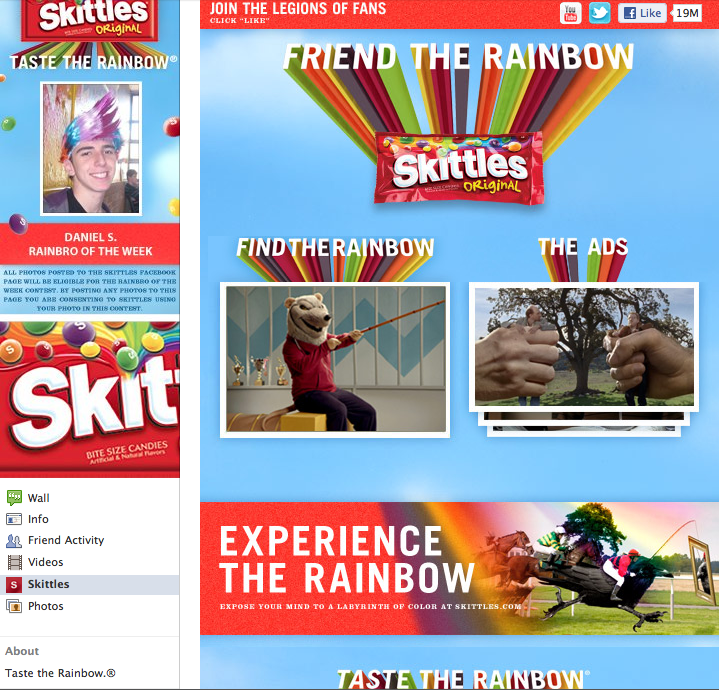 Skittles business page with custom developmentLocal Business page with custom development, content and interactivity. Creating a business page that is infused with your business personality and ethos means that your captive audience will have a better sense of who you are and what you stand for. Facebook users are looking for fun and interactivity. They don’t want to be “sold to” directly but they don’t mind engaging with their brands of choice. And of course a clear call to action! There is no logical reason for your brand to be stagnate, stale or mediocre. By combining clever design, great copy and focussed campaigning you can make your effort spent on social media lucrative and worthwhile. If you have suggestions for great or not-so-great pages, feel free to share.